Here at Southern Charm Mini Aussies we pay very close attention to the stages of development of our newborn puppies from the day they are conceived, to the day they go to their new homes. These eight to ten weeks are the formative weeks to assuring that our puppies have the best opportunity to become healthy, well balanced fur-family members for their new adoptive families. Transforming a puppy into an adult requires both genetic selection, proper socialization and behavioral development. Below you will learn not only the development stages that take place under our watch, but the additional development stages that will take place after taking your puppy home. Hopefully this information will help prospective new puppy owners be aware of the normal development stages of a puppy and help address each of them in a positive manor to assure that our Boot Top Babies turn out to be the best dog of your life! Raising puppies correctly is mandatory if we are to maximize the potential of each puppy. This responsibility is transferred to the puppies new family when the puppy is adopted. Hopefully this information will help enlighten new puppy owners to continue to stimulate their new puppies learning ability, interests and natural instincts. There are several periods in a puppy's development where socialization exercises can have the most benefit. There are "windows of opportunity" in their development that learning is easier. There are also "sensitive stages" that need to be recognized and dealt with accordingly. These transition periods move from one stage to another gradually and if not aware of what stage should be next, it would be easy to miss a important step in the proper development of a new puppy. The future behavior of a puppy begins even before it is born. The temperament of the mother plays an important role on the way the puppy looks at the world. In most cases, a calm and relaxed mother will raise well balanced puppies. A fearful, stressed mother will teach her puppies to be that way as well. We make every effort to keep our pregnant mothers in a non stressful environment and make them feel pampered and special when pregnant with lots of extra petting and attention. This helps produce puppies with a better start to life. Newborn puppies can not regulate body temperature and must be kept warm. If allowed to chill they can develop infections, pneumonia and digestive issues. These exercises stimulate the brain and benefit the puppy with improved cardiovascular, stronger heart beats, stronger andrenal glands and have better resistance to diseases. open and they begin to be able to go potty on their own. They start to walk instead of crawl. They begin to get teeth around 20 days and show signs of wanting to play with their litter mates. During this period all focus is on the puppies here at Boot Top. "babysitting" time and start to take short breaks away from the puppies. A lot happens during this week and we make sure that human contact is a natural part of their development as they begin to get their motor skills. This is a very important early socialization week. The amount of time spent with the puppies this week of development will result in their human bond for the rest of their lives. This period is also very important that the mother is stress free and stable as the puppies become more aware of their surroundings. At this stage fear has not yet developed. This is the stage where the puppies need to be exposed to sudden noises like turning on the vacuum, radio, hair dryer etc. The startle response needs to be experienced and the puppy allowed to return to normal quickly before the fear stage begins. This needs to happen so the puppy knows that when startled throughout the rest of his life, he can return to normal and everything will be ok. A puppy that has not had these experiences during this stage of development will more than likely be a "fearful" dog as a adult. The puppies will begin a loose pecking order at this stage and start "play fighting" with each other. They will also begin to eat food, but still be nursing their mothers as well. We offer them a very nutritious gruel at this time. Mother will begin to teach them to nurse more gently and when to quit as they now have teeth. This is the first lessons on discipline. Puppies will be eating well by this time and the mothers are well into the process of weaning their puppies. They will spend less and less time with them, but still checking on them on a regular basis. During this period the puppies need physical and mental challenges. They need toys that they can climb on, move, chew on, carry around and tug on with their litter mates. Puppies that are not physically and mentally challenged at this age become slow learners as they get continue to develop. During this stage the puppies need to be removed from the litter and worked with individually. Separating the puppies from the litter for short periods of time will teach them independence, prevent separation anxiety and help with human bonding. The more things the puppies can be introduced to during this period the better socialized the puppy will be and the less fearful of day to day encounters. Undersocialized dogs are shy and fearful. We work hard at Southern Charm Mini Aussies to make sure our puppies are well socialized. This process goes on for months after our adoptive families take their puppies home. As responsible owners, it is the responsibility of the new owners to continue this process and not just keep their new puppy at home. It is VERY important that new puppy owners continue the socialization process to assure a well socialized dog when they mature. "Fear Stage" during this time. If frightened during this fear period by a specific noise or event the puppy may have this fear for the rest of its life. It is very important to recognize this period when it comes around. Sounds, Items and people that the puppy had no fear of before; this stage may all of a sudden make them fearful. Do not press the issue! If the puppy has always liked Uncle Bob and now he is afraid of him just let it be ! If you push the issue the puppy may never like Uncle Bob again! If you just ignore the situation when the fear stage is gone, so will be the fear of Uncle Bob. Unlike other growth period that can come on gradually, the fear stage can come on rather quickly. One day not fearful - the next in the fear stage. During this period puppies are busy exploring their new world. Their senses are keen and their ready for a challenge of what to climb over, into, through, or under. They are ready and eager to learn, but still have short attention spans. It is important that puppies at this age have a chance to play with other puppies or dogs. There are still many doggie social skills they need to learn. A puppy who does not get the chance to play with other puppies or dogs at this age may have a more difficult time interacting with other dogs as a adult. Puppies will begin to test dominance and leadership at this age. Puppies that were very compliant in the past will begin to test your authority and have opinions of their own. I compare this stage to that of a teen-age human going through adolescence. A puppy that has always been happy in his crate at night for example, may throw a actual "temper tantrum" when it's time to crate. During this time it is very important that the "Alpha" be established. What most people do not realize, is that there is a canine way of establishing the "Alpha". (A write and a wrong) way to do this. This is a critical time for learning for the puppy. This a perfect time to attend a puppy/obedience class. This period is your last chance for effective puppy socialization skills. After this time, the puppy will rely on what he has previously learned to cope with socialization. The socialization process is life long and should never stop, but the learning of new socialization skills diminishes after this age. During this period a puppy that has always come to you whenever you have called him all of a sudden will want to run away from you. This is a time to be sure and avoid the possibility of your dog darting out into the street by keeping him in a enclosed area or on a leash. Puppies will "test their wings" during this period. It is important to not scold your puppy for not coming, but to praise him when he does come to you. Remember this is a phase and if handled properly with positive reinforcement will pass without to many frustrating moments. Somewhere during this time period your puppy will go through a second fear stage similar to the first. It varies from dog to dog when this will occur. It is VERY important that you recognize that this is a fear stage when it arrives so you can treat it with care. The same seriousness needs to be put in place for this fear stage as for the one early on in your puppy's life. A puppy that may have loved everyone he has ever met will all of a sudden have a fear of everyone. Remember the story about Uncle Bob from the first fear period! Make light of the fear and instead distract the puppy from what he is afraid of and remove him from the situation with something positive like a toy or treat. Be sure not to ever console a puppy that is afraid. You will only intensify the fear. Instead distract the puppy and get him out of the fearful situation and give him something else to think about. 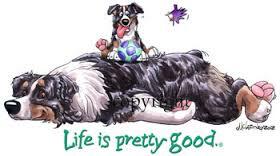 Here at Southern Charm Mini Aussies we are always available to our customers for the life of their dog to answer questions and give suggestions. Raising an Aussie puppy is a wonderful experience! There is not words to explain the feeling when your Aussie puppy looks into your eyes and almost talks to you. The intelligence level and desire to please is so unbelievable with breed that rairaising a Aussie puppy is one of the most rewarding experiences you will ever have! We hope this guideline of development will enhance your experience.